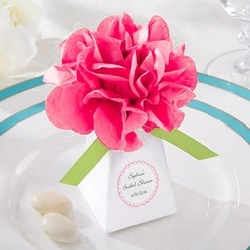 Let your love bloom along with the flowers and spring wedding theme favors. Let your wedding-day songs hum along with the busy bees. It’s springtime, and you are ready to start the next season of your life. Let it be the warmest season filled with warmth and love. 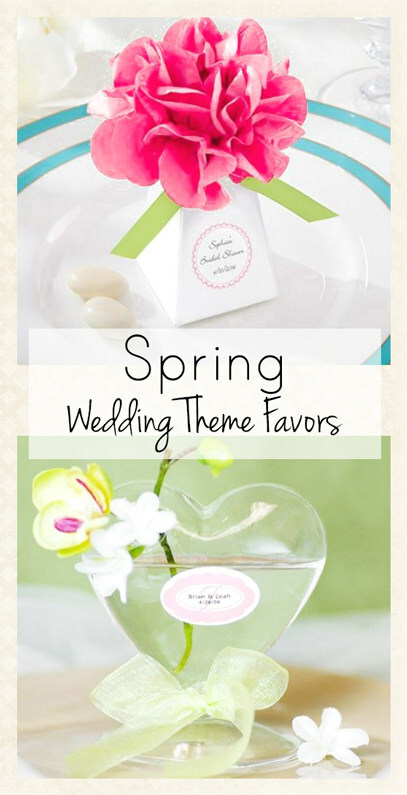 The spring wedding theme is a diverse selection because there are so many different symbols of this season. You go with flowers and declare your love a wild flower ready to bloom or stick with a rainy theme, incorporating beautiful blues and white accents. 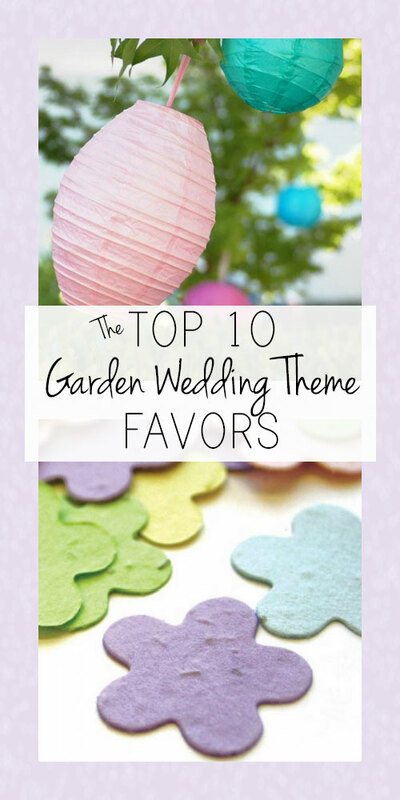 Spring weddings are often held outdoors, and there are many favor ideas that won’t blow away with the wind. 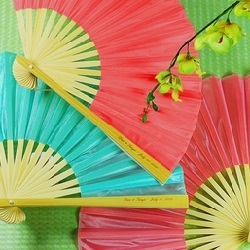 Think about your chosen colors and the age of your guests as you select from the following spring wedding favor ideas. There is a little something for everyone, and many will serve as decorative features as well as favors. Mason Jars with Flower Lids and Decorative Straws – Personalized - What did you do with Mason jars when you were little? Did you trap fireflies or sip sweet tea? 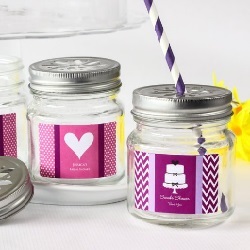 These mini jars are sealed with decorative cutout lids and topped with colorful straws, so they make eye-catching decorative features for any spring or summer wedding. You get to customize the label, including selecting the color scheme and thematic design. You can fill each jar with candy or just leave them empty for your guests to enjoy at home. 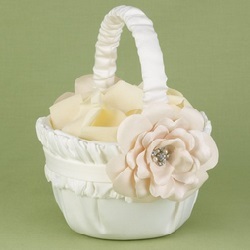 Pom Pom Favor Boxes – Personalized - The beautiful pom poms on top of these boxes look like double-bloom flowers. The boxes are shaped like pedestals, and you get to select the personalization for each label. If you have personalized Hershey’s kisses, hard candy or mints, you can quickly fill these boxes with sweet treats every guest will enjoy. The colorful pom poms will also add to the festive décor for your reception. If you want authentic flowers on your boxes, there are Gerber Daisy favor boxes as well. 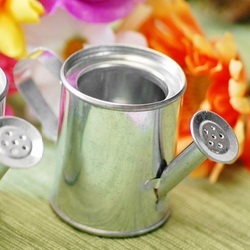 Mini Honey Pot Favors - These decorative honey pots are adorable and will appeal to guests young and old. They come in individual boxes topped with decorative bows. 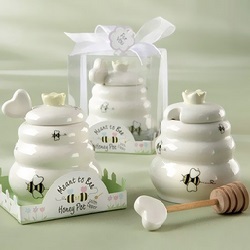 If bees are a big part of your decorative theme or you are holding your spring wedding outdoors, these pots are the perfect favors to remind your guests of your happy day. These are functional honey pots that your guests can use at home. 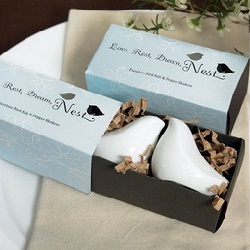 Love Birds Salt and Pepper Shakers - These love bird salt and pepper shakers come in adorable nest-themed boxes. The top of each box reads “Love, Rest, Dream, Nest.” The shape of each shaker is subtle and elegant, and they are pure white to match any spring wedding color scheme. As you start to nest together and sing the song of love, you can send your wedding guests off with cute song birds of their own. 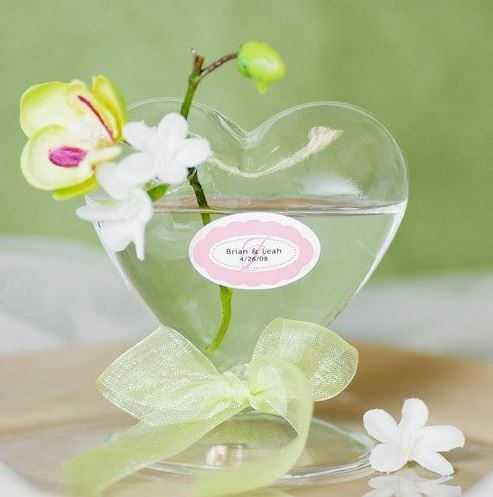 Cherry Blossom Glass Coaster - Not every wedding favor has to look or act like a wedding favor. 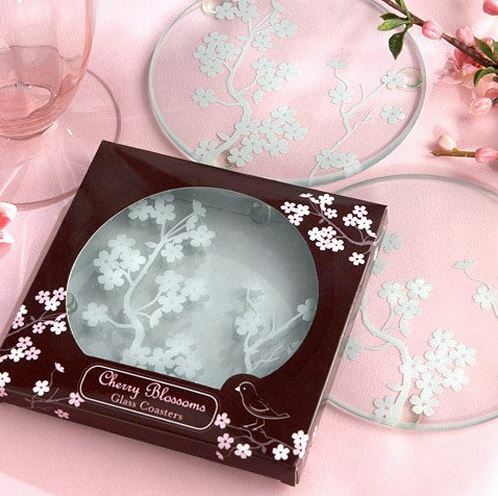 These beautiful glass coasters feature cherry blossoms that are perfect for spring. Let your guests take them home, and the coasters will serve their homes in a functional manner for years to come. 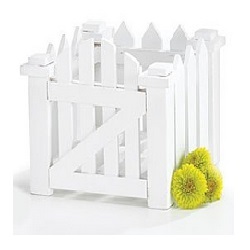 White Wood Picket Fence Planter - These adorable planters represent the traditional sense of marriage bliss…the white picket fence that protects your perfect family from unwanted intrusion. Each planter comes with a plastic liner, so you can really plant flowers and let them bloom in time for your wedding day. You may also include personalized seed card favors to complete your adorable summer-themed wedding favors.